Active Motif's Tag-ChIP-IT® Kit offers a method to perform ChIP without the need for protein-specific antibodies. Simply create an expression construct containing the protein of interest in-frame with a C-terminal AM-tag that is specifically designed to work in ChIP and produce highly consistent and reliable results. Active Motif's AM-tag offers several advantages over other tags, such as FLAG, GFP and HA. AM-tag is specifically designed to give low background signal in ChIP experiments. Also, in contrast to larger GFP and Halo® tags, the low molecular weight and unstructured design of the AM-tag reduces the possibility of impeding on the DNA binding domain. In addition, we have designed a high specificity antibody to the tag to increase the pull down efficiency during immunoprecipitation. Use the pAM_1C Empty Vector to clone your protein of interest, or add the AM-tag sequence to the expression vector of choice. Following transfection and expression of your tagged protein, the Tag-ChIP-IT Kit can be used to isolate chromatin and perform immunoprecipitations using an antibody directed against the AM-tag. The Tag-ChIP-IT method yields highly reproducible results with proven performance in both qPCR and ChIP-Seq analysis. Tag-ChIP-IT is Used to Identify Estrogen Receptor (ER) Binding Motifs. To learn more about Tag-ChIP-IT®, click on the Method, Data, or Contents tabs below. To view a manual or other related documents, click on the Documents tab below. How does the Tag-ChIP-IT® Kit work? Simply use the pAM_1C Empty Vector to clone your protein of interest in-frame with the C-terminal AM-tag. Alternatively, the AM-tag sequence can be cloned into your expression vector of choice. Following transfection and expression of your tagged protein, the Tag-ChIP-IT Kit can be used to isolate chromatin and perform immunoprecipitations using AM-Tag antibody specific for the AM-tag. Figure 1: Flow Chart of the Tag-ChIP-IT Assay. Prior to using the Tag-ChIP-IT® Kit, the protein of interest is cloned into an expression vector containing the C-terminal AM-tag, such as Active Motif's pAM_1C Empty Vector (Catalog No. 53023). Following sequence verification of the cloned insert, cells are transfected for expression of the AM-tagged fusion protein. Once transfection and expression conditions have been optimized, chromatin is prepared from the transfected cells using the Tag-ChIP-IT Kit. Intact cells are fixed with a specially formulated formaldehyde buffer, which cross-links and preserves protein/DNA interactions. DNA is then sheared into small fragments using sonication and incubated with an antibody directed against the AM-tag. The antibody-bound protein/DNA complexes are immunoprecipitated through the use of Protein G agarose beads and washed via gravity filtration. Following immunoprecipitation, the DNA cross-links are reversed, the proteins are removed by Proteinase K and the DNA is recovered and purified. 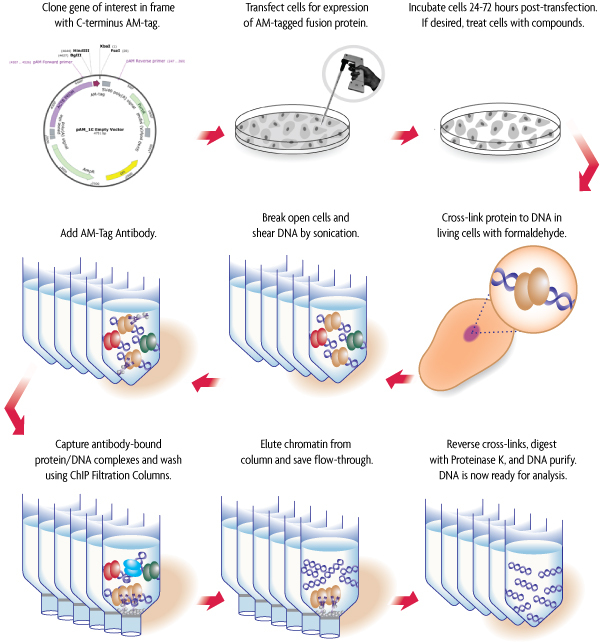 ChIP enriched DNA can be used for either gene-specific or whole-genome analysis. Transcription factor ChIP is often challenging due to a lack of available antibodies that are capable of recognizing target-bound protein of interest post-fixation, or the inability of available antibodies to distinguish between protein isoforms. Tag-ChIP-IT® Kit overcomes these challenges by enabling ChIP without the use of target-specific antibodies. With Tag-ChIP-IT, the protein of interest is cloned in-frame with a C-terminal AM-tag sequence. Following transfection and expression of the tagged protein, chromatin can be isolated and immunoprecipitated using an antibody directed against the AM-tag. The unique AM-tag is specifically designed to minimize cross-reactivity with mammalian samples for reduced background signal. Additionally, the design maximizes exposure of the AM-tag during the immunoprecipitation reaction to increase the enrichment efficiency of low abundance transcription factors for more reliable and consistent ChIP results. A comparison of the Tag-ChIP-IT method versus ChIP using an antibody against the endogenous protein of interest reveals the same ChIP-Seq profile between the two methods. Replicate experiments also confirm the reproducibility of Tag-ChIP-IT. 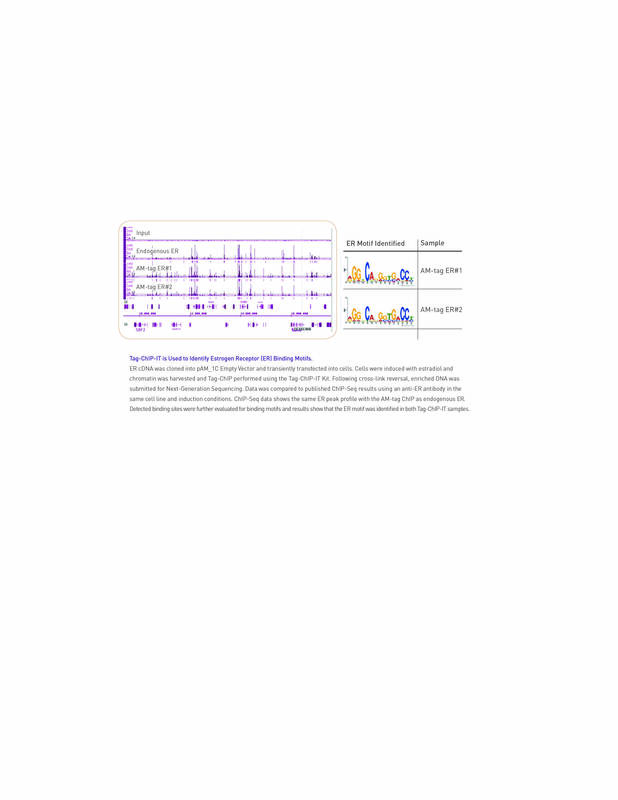 Figure 1: Comparison of endogenous and AM-tag ChIP-seq data for estrogen receptor binding motifs. Estrogen Receptor (ER) cDNA was cloned into pAM_1C Empty Vector (Catalog No. 53023) and sequence verified. Transient transfections were performed into Ishikawa cells. Cells were induced with estradiol (E2) and chromatin was harvested according to the instructions in the Tag-ChIP-IT Kit. The AM-Tag antibody was used to immunoprecipitate the cross-linked AM-tag-ER fusion protein. Following reversal of cross-links, enriched DNA was submitted for next generation sequencing. 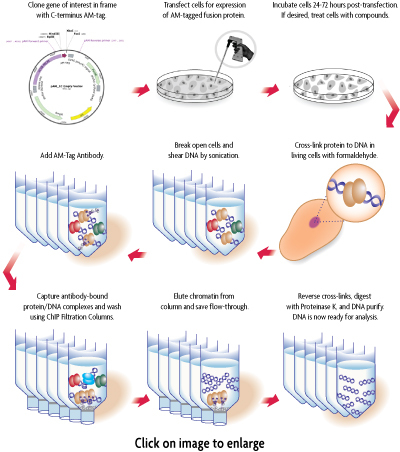 Data was compared to published ChIP-Seq results using an anti-ER antibody in the same cell line and induction conditions. ChIP-Seq data shows the same ER peak profile with the AM-tag immunoprecipitation as endogenous ER. The binding sites detected with the AM-tag samples were further evaluated for binding motifs. 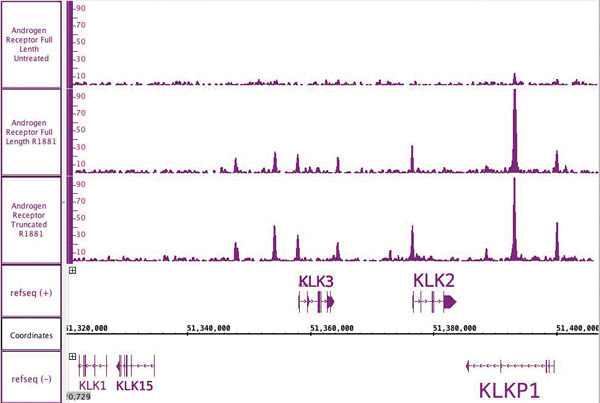 Results show that the estrogen receptor motif was indentified in both Tag-ChIP-IT samples. One of the challenges of studying the effects of sequence variants, mutations and truncations on gene regulation involves the lack of available antibodies capable of distinguishing between protein isoforms. With Tag-ChIP-IT, each protein variant can be cloned and tagged separately to enable individual analysis.